So before Santa can hit the roads, he needs to get his truck driving skills up. 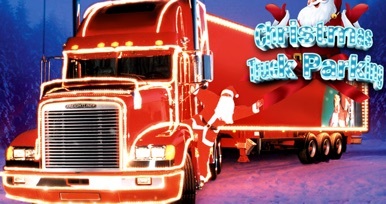 Can you make a real trucker out of Santa in this free Christmas game for kids and grown-ups? Christmas truck parking 3D is the Holiday game fun to play on Christmas day or Christmas eve. If you love to play Christmas games, after you decorated the three, or after installing xmas songs on your mobile. Then try this Christmas game for free. And have major fun driving around in the big red truck on parking yards filled with snow. Enjoy the holiday feeling with this cool looking 3D parking game. Good old Saint Nick knows parking in the holiday season is total parking madness, busses, cars, taxi drivers al fighting for the best parking spot in the parking lot. So go crazy with Christmas truck parking 3D and see if you have the skills needed to clear all levels. This Christmas game has the following 3D parking features. So make sure Santa is already to drive away in his very own parking truck, clear al the levels and get some major parking skills with this funny and exciting 3D parking game. We hope you surely will enjoy this parking game and of course we wish you a Mary Mary Christmas. Quadratic Equations for Algebra 1 app gives in-depth knowledge about how to solve quadratic equations. In this version we have added, more content, flashcards, SAT/ACT style test.